Click photo for Anna's website! Inspired by Disney's Fantasia to play violin at age 4, violist Anna Bross hasn't been able to stop performing ever since. She has gone from playing in Grandma's living room to pursuing her dream in Symphony Orchestras and Chamber Groups all across America. She has performed in Arkansas, Colorado, Illinois, Michigan Washington, and in the Washington DC/Baltimore area, where she currently resides. Ms. Bross has formerly served as principal of the Illinois Valley Symphony, The Kishwaukee Symphony, the NIU Philharmonic and the Peabody Concert Ochestra, and has also performed with the Richmond Symphony Orchestra. An avid chamber musician, she has traveled to study with artists such as The Avalon String Quartet, Anthony Elliott, Richard Wolfe, Mathias Tacke, Drew Irvin and Michael Gurt. Always eager to bring new music to life, Anna enjoys working closely with contemporary composers to premiere new chamber and solo works. Anna has a tremendous passion for teaching, and has maintained a private violin and viola studio since 2008. She aims to help guide her students unique musical voice to form lasting and meaningful connections with their audiences and the people around them. In addition to her own studio, Anna is currently on the violin/viola faculty at the Opus Community Music School in Eldersburg, MD. Ms. Bross received her Bachelor’s degree from Northern Illinois University in 2011 and her Master's Degree from the Peabody Conservatory in 2013. Her primary teachers include Anthony Devroye, Li-Kuo Chang and Maria Lambros. A native of Indonesia, Bagus Wiswakarma studied violin at the Hochschule fuer Musik und Theater Hamburg, Germany (Prof. Winfried Ruessmann). Additional pedagogical studies include the Amadeus Quartet, Brandis Quartet, Schleswig Holstein Music Festival in Europe and Asean Youth Music Workshop. Mr. Wiswakarma is a concert soloist and Founder/Director of the Chamber Music Series (Jakarta, Indonesia 1999 – 2006). He also served as the Director of the International Music School (Jakarta, 2000 – 2006) and Music Director of the Jakarta Philharmonia 2003 – 2005. Cellist Tzu-Jou Yeh is a native of Taiwan and has had extensive performance and education experience in areas of solo, chamber music. She holds a Masters in Cello Performance from the Peabody Conservatory of Music under the tutelage of renowned cellist Amit Peled. For her outstanding achievements in chamber music, she was awarded the Grace Claggett Ranney Prize in 2015. She has had masterclasses with artistes such as Steven Isserlis, Paul Katz,, Schmuel Magan, David Krieger, Karel Fiala and Matt Haimovitz. A proponent of historical performance, she also studies the baroque cello with John Moran and has performed as a soloist with the Baltimore Baroque Band. She is currently pursuing a Doctor of Musical Arts degree in Cello Performance at Peabody Conservatory of Music. Tzu-Jou currently plays on a 1947 Gaetano Gadda on generous loan from the Chimei Museum Foundation. Ms Wiswakarma’s professional degrees include Vordiplom-Dinieren (Conducting) and Diplom-Rhythmik, Diplom (Hochschule fuer Musik und Theater Hamburg, Germany), Music Lehrerin (Eurhythmics music teacher) and a Bachelor of Arts (Music Education, St. Mary’s College, Maryland). She has special experience in the area of Piano Methods and is expert in the area of Eurhythmics and Movements. Pamela is and experienced teacher in preprimary, primary and secondary school, in areas of music, dance and drama. Ms Wiswakarma’s extensive teaching, conducting and music director experience includes Australian International School Kemang Kampus, Jakarta; Sekolah Ichthus South, Jakarta; Sekolah Mentari, Jakarta; Bambino Kindergarten, Jakarta; Sekola Cita Buana; PPIA International Choir, Jakarta; Yayasan Musik International, Jakarta; The Harburger Maenner chor and the Harburger Frauen Chor and the Phoenix Orchestra in the Friedrich-Ebert Halle, Hamburg-Harburg, Germany; The Harburger Maenner Chor and the Harburger Frauen Chor in the Friedrich-Ebert Halla, Hamburg-Hartburg, Germany; The DESY Orchestra, Hamburg, Germany; The Hamburg Bach Society Orchestra, Germany. She has served as Guest Conductor for Orchestral Ensembles and Choirs in both Europe and America. Ms Wiswakarma won 1st Prize as conductor in the Choir competition in the Winsener Statd Halle, Winsen, Germany in September 1996. Ms Wiswakarma has been a private piano instructor in Hamburg, Germany and a piano accompanist for concerts and recitals in Europe and America. In addition to her teaching and conducting experience, Pamela has also performed as a singer in the Baltimore Symphony Choir, Baltimore, Maryland. Professor Lisa Weiss came to Goucher in 1986 as a result of the college’s desire to experiment with a position that was new to the institution: a full time performance faculty member in the music department. She currently teaches private and classroom piano, directs a lecture series for music majors and minors, co-directs the Goucher Musical Theater and Opera program, and is a frequent collaborator and accompanist for both students and faculty. She has chaired the music department, led two study abroad music programs in Italy, and was for many years the director of the student Chamber Music Seminar. She was also a recipient of the Todd Professorship, an honor bestowed on one professor every five years at Goucher. Dr.Weiss holds a B.A. from Harvard University, an M.M. from The Yale School of Music, and a D.M.A. from The Peabody Conservatory, where she studied with Leon Fleisher. She also holds an M.F.A. in creative writing from Lesley University and has published several stories in the flash fiction genre. She began playing when she was three and made her solo debut with the Boston Pops at age seven. Of her New York debut, New Times critic Wil Crutchfield wrote, “…a musician worth attention and able to hold it.” She concertizes regularly as a soloist, chamber musician, and vocal accompanist. A versatile pianist, her recent performances include a new work for piano and electronics by Baltimore composer Samuel Burt, performed at Artscape “World’s in Collusion” event this past summer, and ongoing collaborative-improvisatory piano and dance projects with “What’s Written Within,” a dance company on Martha’s Vineyard. She remains passionately committed to her lifelong practice: learning and performing the incredibly vast, varied and important repertoire for solo piano. Pianist Tim Hartnett has pursued advanced study in both piano performance and piano pedagogy over the past three decades. He first began his training under the tutorship of Karen England of the Howard County Music Teachers Assocation, and more recently studied with both Dr. Michael Adcock of the Washington and Peabody Conservatories and Dr. Audrey Andrist of UMBC, after admission into a graduate program of Piano Performance. Currently, Mr. Hartnett is pursuing a graduate performance diploma through the Associated Board of the Royal Schools of Music. In addition to his music education, he holds a Masters of Science in Applied Mathematics from the Johns Hopkins Whiting School of Engineering, with a strong interest in the role of mathematics in music. As a teacher, Mr. Hartnett has been an efficient and successful mentor for all ages and levels with a philosophy that emphasizes a strong foundation in both music history and theory, in addition to technique. Mr. Hartnett has extensive experience as a competition adjudicator, having prepared students for competitions, scholarship and performance auditions, as well as various piano and music theory exams at all levels. Consulting Editor of the John Bresnik Jazz piano method, Mr. Hartnett is formerly an instructor at Mike's Music in Ellicott City, MD. He currently resides in Dayton, MD. Larry Wilson has been teaching guitar in the Eldersburg area for eight years, and in Carroll County since 1990. Larry studied classical guitar with William Sims from Peabody and played in the Baltimore Classical Guitar Society from 1998-2005. Larry has played in various gospel and jazz bands, receiving awards for his jazz playing, beginning with the Band Director’s award while still in school, the highest award given. Currently, Larry performs as a studio musician at New Castle Studio, while maintaining a large studio of private students. Opus is thrilled to be able to provide guitar lessons with Larry. Larry teaches guitar in our Eldersburg studio. Praised by the Journal of Music as “remarkably elegant…sensitive and brilliant” flutist Grace Ju -Yeon Wang enjoys a versatile career as a soloist, chamber musician and educator. Having performed worldwide across Asia, Europe, Africa and North America, she has performed on stages including Seoul Arts Center, Sejong Center for the Performing Arts, The Clarice Smith Performing Arts Center, Carnegie Hall and multiple appearances at the Kennedy Center. Grace is a prize winner of the American Protégé International Flute Competition, Rochester Flute Association Competition, Baltimore Music Club Competition, South Carolina Flute Society Young Artist Competition and was selected as a semi-finalist for Astral Artists National Auditions and the Concert Artist Guild Victor Elmaleh Competitions. As founder and flutist of Daraja Ensemble, she has made appearances at the Riverdale Mansion, Washington Arts Club, Amadeus Concert Series, and many more. The Quintet held the Fellowship Quintet Residency at the University of Maryland from 2015-2017 and were finalist for the International Chesapeake Chamber Music Competition. In 2016, the quintet traveled to Tanzania, Africa to start a new music education program for the schools in the sugar plantation area. As a chamber musician she has performed nationwide as a member of the TIMF Ensemble and Lunar Ensemble and was invited to premiere Daniel Thomas Davis’s piece “Book of the Lake” commissioned by the Walters Art Museum in Baltimore, Maryland. She has studied with Marina Piccinini for her Master’s and Graduate Performance Degree at the Peabody Institute of Johns Hopkins University and holds a Bachelor’s Degree from Seoul National University. Currently she is pursuing a Doctorate of Musical Arts at the University of Maryland under the tutelage Sarah Frisof. As a passionate educator of solo and chamber music, Grace has given masterclasses throughout the US and Asia, and serves as faculty member at DeMatha Catholic High School, Honors College Prep and Woodbridge Music Institute. Barbara Anastasion teaches clarinet at OPUS. She is a 15 year veteran instrumental music teacher in Carroll County, MD. She teaches 4th grade band, 5th grade band, 4th grade orchestra, 5th grade orchestra, and Kindergarten vocal/general music. She has taught privately since 2000 in Harford, Baltimore, and Carroll Counties. Barbara began playing the clarinet in 4th grade, and also doubled on the tenor saxophone for jazz band in high school. She is a music graduate of Towson University, having studied under Ed Palanker, Dan Silver, and Chris Wolfe. She received her Master's Degree in Curriculum and Instruction in 2008. Barbara is also a National Board Certified music educator. She is an alumni member of Kappa Kappa Psi, National Honorary Band Fraternity. Barbara is actively involved in the state level of the MBDA (Maryland Band Directors Association) and is the All State Band Auditions co-chairperson. She assists with recruiting the adjudicators for the auditions, and organizes the on-site check-in/registration for the hundreds of students that audition during the two weekends of auditions each November. She serves on the executive board of the MBDA. She also adjudicates for the State Solo and Ensemble Festival each spring. Barbara directs the hand bell choir and children's choir at her church. She is also currently the color guard instructor for South Carroll High School. Barbara has a primary aged daughter who takes violin lessons at OPUS and loves to sing and dance, and a young toddler-aged son who loves to bang on things! Barbara teaches in our Eldersburg studio. Appointed in 2015 as an Instructor of Oboe and Saxophone with Opus Community Music School and a Faculty Clinician with Academy of St. Cecilia Youth Orchestra in Damascus, Mark Runkles completed his Doctor of Musical Arts in Oboe Performance at UNLV. Dr. Runkles earned his Master of Fine Arts in Oboe Performance and Master of Arts in Jazz Studies from the University of Iowa and his Bachelor of Arts in Oboe Performance from St. Mary’s College of Maryland. He formed the Twin Arch Duo, which plays a mixture of standards and his own contemporary jazz compositions, with guitarist Charlie Trapp in 2013. In 2008, Dr. Runkles performed a series of Jazz Vespers services in Scotland. He served as the Assistant Principal Oboe with the Chesapeake Orchestra from 1999–2004 and performed on 2nd Oboe with the Las Vegas Philharmonic from the winter of 2009 through 2012. Dr. Runkles is an oboe student of Stephen Caplan, Mark Weiger, and Vladimir Lande and a saxophone student of John Rapson and Don Stapleson. David Anderson is a freelance horn player, teacher, and coffee fanatic. He began playing 15 years ago when he found a WWII era trumpet in his grandfather's attic. When not playing or teaching, you can find him in Baltimore gardening and drinking tea with his fiancée and two cats. Less is more. David’s approach to music stems from the Pareto Principle, or 80:20 rule, which states that 80% or results come from 20% of the work. By focussing only on musical ideas it is possible to achieve excellent technique and sound. If it sounds good, it is good. David has appeared in performances with the Lancaster Symphony, Fairfax Symphony, Maryland Choral Society, Manassass Ballet Theater Orchestra, American Festival Pops Orchestra and the McClean Orchestra. 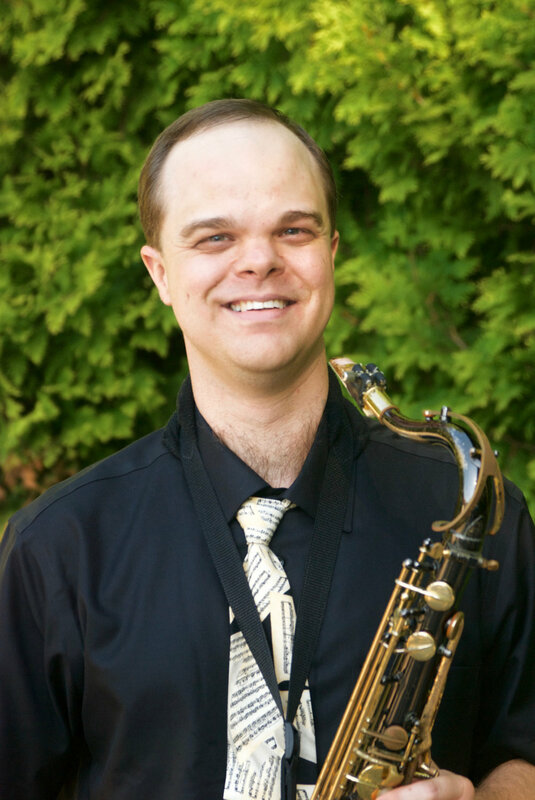 David has been working with horn and trumpet players for over a decade and is a graduate of The Peabody Conservatory and George Mason University.